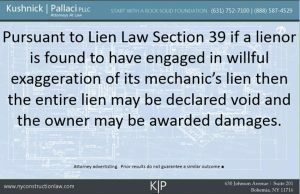 One of the most effective weapons against mechanic’s lien abuse by contractors is the owner’s ability to use Lien Law Section 39 and 39-a to defend against a “willful exaggeration” of a mechanic’s lien. However, the burden of proving the “intent” necessary to establish that the exaggeration was “willful” can often be difficult, though not impossible, to achieve. A recent 2017 decision from the Appellate Division, Third Department, offers a demonstration of the difficulty in establishing willful exaggeration. Blair v. Ferris involved a contractor foreclosing upon a mechanic’s lien for funds that it believed were not paid by homeowners. The case offers a nice discussion of the burden of proof needed to establish the amount due, including stating that oral testimony of the lienor alone, without documentary evidence, can be sufficient proof. However, the interesting discussion revolves around the homeowner’s defense and claim of willful exaggeration. Based on the written decision, it appears that at trial it was established that the contractor filed a mechanic’s lien for $160,633. Given the discussion about evidence, it appears that the only evidence offered as to value was the contractor’s oral testimony. The trial court eventually ruled in favor of the contractor-lienor but only awarded damages of $57,600. The lien, therefore, was more than $100,000 more than what plaintiff established at trial. Moreover, the appellate division appears to believe that the calculation of $57,600 was incorrect and, in fact, reversed the award and sent it back to the trial court for further proceeding. Though not explicit, the appellate court appears to believe that the $57,600 was too much based upon the math it could deduce from the facts. While the decision does not directly state an amount, it appears that the court believes the actual amount established by plaintiff may be in the range of $25,000 (against a $160,633 lien). On its face, it would appear that the lien was exaggerated because it was significantly more than the amount plaintiff established. The real question then is whether it was “willfully” exaggerated. Here, the appellate division said no, it was not. 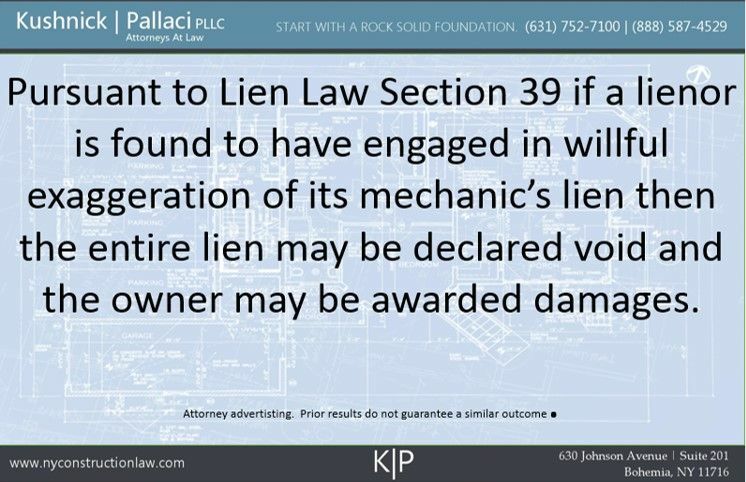 The Court stated that “it is well established that inaccuracy in the amount of the lien, if no exaggeration is intended, does not void a mechanic’s lien; willfulness also must be shown.” The court noted further “the fact that a lien may contain improper charges or mistakes does not, in and of itself, establish that a plaintiff willfully exaggerated a lien.” As to the burden of proof, the court unequivocally held that the owners had the burden to “show that the amounts set forth in the lien were intentionally and deliberately exaggerated” and that the Lien Law “must be strictly construed in favor” of the lienor. Applying this strict standard, even against a lien that was apparently “exaggerated” and without documentary backup, the Court found no basis to award exaggeration damages under Section 39 or 39-a because the proof of intent was lacking and, therefore, the exaggeration (the Court never actually never even specifically calls the discrepancy an exaggeration) was not willful. Vincent T. Pallaci is the managing member of Kushnick Pallaci PLLC. The firm’s construction lawyers regularly enforce and defend against mechanic’s liens in New York including claims of willful exaggeration. This entry was posted in Construction Litigation, Exaggeration, Lien Foreclosure, Mechanic's Liens and tagged Liens, Willful Exaggeration by VTP. Bookmark the permalink.